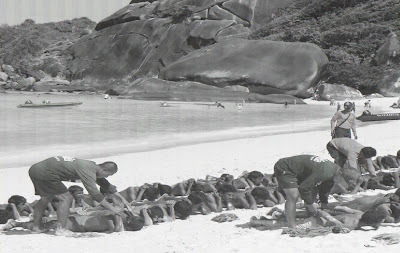 ... we where also at Similand Island 23 dec 2008 when Thai navy force these refugees into the beach. It was horrible to see the treatment disparity between tourists and these Burma men. We think it was the last time we visit Thailand, if the human rights in lovely Thailand not gonna change. It has been one full page in a newspaper(Aftonbladet) here in Sweden about this. . .
Urban has passed along to Jotman some of the photos he took. They show officers of the Thai Navy rounding up the refugees while tourists frolic on the beach. Meanwhile, CNN correspondent Dan Rivers traveled to the remote Thai island where the refugees had been detained (story). He also obtained photos from the Thai Navy showing the refugees being set adrift in the high seas (h/tBangkok Pundit). New Mandala blog notes that acording to a human rights group report, one of the military officers involved in the the abuse and deaths of numerous Rohingya refugees was implicated in a previous atrocity. Check out the the attached CNN video, it includes some extaordinary new evidence. This is my third post this month about the plight of the Rohingyans.